The orientation is either variable (rotating with the device) or can be fixed to landscape or porttrait. Default is varible. --> Tip: ON HVGA devices landscape + medium size is a nice fit. White is the default background. You can choose to get a little color in the background: gray, gree and blue are the choices. If activated teh exact time is shown on the bottom left and right. 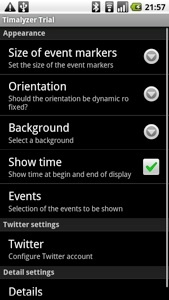 You can select which events should be displayed. This is straight forward. This opens the twitter settings subpage. 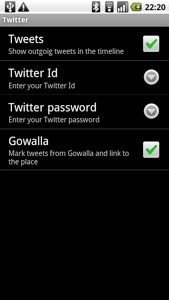 Another access to select whether your tweets should be displayed. Obviously the application needs your twitter credentials. This is an experimental feature (tell us what you think! ): If this is activated tweets containing a link to gwal.la are marked a bit different and tapping them opens the browser with the link (usually the location you checked in). If activated, the timestamp in the grid is reduced to just a date. 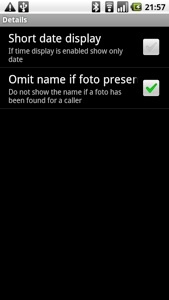 If activated (default) names are not shown for cantacts that have a photo attached.